Thanks to a $100,000 donation from Pella Corporation in Pella, Iowa, the barren stretch of land south of the Agriculture Building was transformed into a beautiful park in 1996. Formerly an open space used for parking and the Iowa National Guard encampment site, the area was landscaped into a 50,000 square foot park featuring benches, flowers, trees and a water fountain. 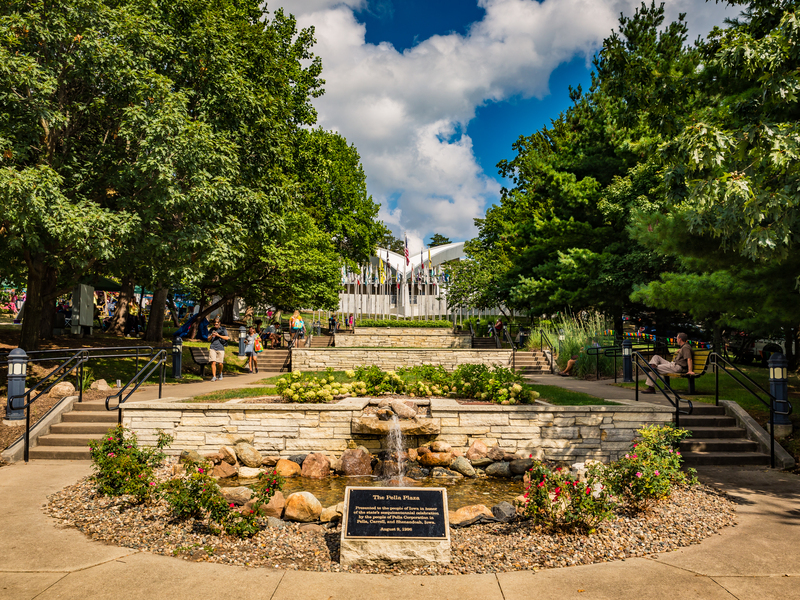 The park’s boulders and limestone come from Iowa quarries, and its benches offer as much quiet as can be found during the Fair. In the middle of the plaza, a flag flies for each of Iowa’s 99 counties. For many, the plaza is a favorite place to sit and rest during the hottest days of the Fair. Pella Plaza was designed by Bob Lenc Landscaping of Des Moines with the help of Adamson Clark Landscape Architecture.